Stepping back a bit and doing some brazing practice. Also testing out a simulation for an ovalized downtube junction at the head tube, filing a miter without a guide. Will see how this cleans up, then cut it apart to check on complete penetration. More practice this weekend. 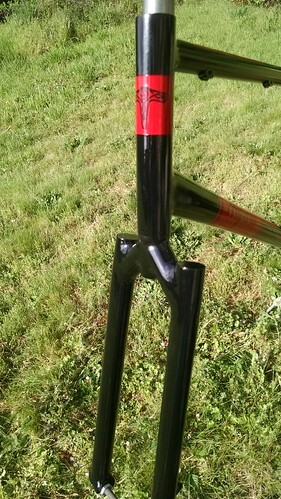 This started out as the first attempt at building a gravel bike. Bit it didn't fit in the jig, so I brazed the BB to the seat tube, then set up the rest of the main triangle on the table with V-blocks. Something happened on the way, though, and the head tube ended up about a half-inch out of plane with the BB. I tried setting it, but broke the composite slate man-handling the thing. So I set it aside. For several months. In fact, I finished the second attempt. Eventually I got a granite slab, and backed it with planks. I looked at this main triangle sitting on a peg, and thought, "What the heck, let's give it a go." Well, after not-too-much heaving, it came into alignment nicely. Now I'd never try to pass this much cold work to a customer, but I'll ride it for myself. So here I had this second main triangle. I thought about what to do with it -- something wild and "out there"? 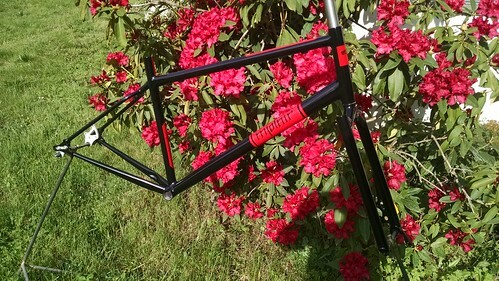 I toyed with ideas, but ended up going with a gravel build, with more BB drop and longer chainstays than the finished build, and also the shorter fork. Brings the whole thing a little closer to the ground. It's not a 'cross bike. I took it with me last night to the season kick-off meeting for the kids tri team that I help coach. One of the other coaches is a big 'cross rider, competes at the national level at adventure racing, all that. She looks at it and says "nice 'cross bike!" 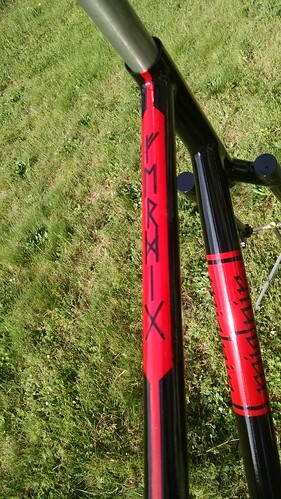 I had to point out the things that make it NOT a 'cross bike, but was kind of funny. Anyway, that's how this one came to be. Still haven't taken it out on its maiden voyage yet. Maiden voyage on the new Thor road bike. I've been on the gravel bikes all year, and after yesterday's Elbe Multi-Strada ride, today was a recovery day. This bike... So light, the rear end so stiff, the front end so smooth and stable... It all added up to speed. And with speed comes excitement, and it just feeds itself. I kept having to remind myself this was a recovery ride. 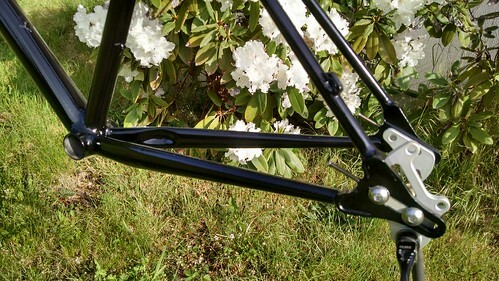 One inch chainstays make the rear end of the bike. Seat cluster. Temporary brake on there, a Brew, until the old Ultegra single pivots come in. I just don't like the look of the dual pivots with narrow rims. And they stop just fine. With the only nod to weight-weenie-ism being the seat post (a cheap carbon job), it still tips the scales at just a hair over 18 lbs as shown. Not too shabby. Thor out on the road this morning, three plus hours into the Cascades and back. Construction complete on a 650c tri bike. Very steep STA, slack HTA. Post color spray, prior to clear coat. Will post more of the partial build (wheels, bars, saddle/post, etc). Chainstay mounted brake, cable runs at the 10 o'clock on the downtube. I was pleasantly surprised to see my bikes featured so prominently in the Oregonian photo spread from the Oregon Handmade Bike and Beer Festival. I had my daughter's push bike leaned up against my all-road, matching paint schemes... Generated a lot of attention. Great show, great people. Another kick bike ready for color. A SS-MTB in work. Bi-oval down tube miter. And ovalizing the top tube at the seat tube junction. I also attended the grand opening of Green River Cyclery and Busted Bike Cafe on Friday last week. Custom size, no matter what your size. Kick bike finished. That is awesome! Great first bike. 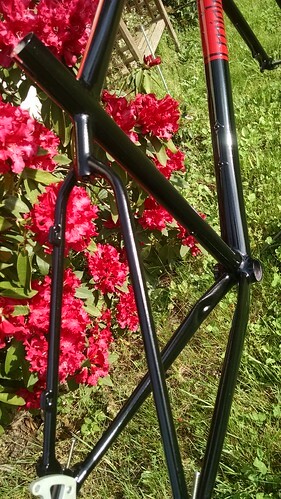 Hard-tail MTB ready for final prep and build. Dedicated single speed, will sport road cranks and drop bars, 26" MTB wheels/tires. Had some fun with the two-color pint scheme and highlighted graphics. Single-speed monster-crosser. My lunchtime trail mobile. Handmade all the way. Handmade bike, handmade trail. Thanks! It's actually modeled after the Ethiopian flag, though the colors are shared by many flags, so I've found. This was my first build using the Gus Salmon decals. Those things just disappear under the clear coat -- no edges.